This summer has been a busy one for me. Immediately after the completion of the Spring semester, I took two weeks off for a backpacking trip in Europe, but after my return from that trip I have been busy writing. I completed and submitted three book chapters, and am near completion on another chapter and a journal article. These latter two should be leaving my table within the next 4-5 days. Given this busy summer, it was a delight to travel to Vancouver, Canada last week. The travel was work-related to present a research paper at the Academy of Management Conference. As a passionate academic, I spent most of this trip attending sessions at the conference. However, my travel plan was such that I reached Vancouver a day before the start of the conference and left a day after. This allowed me to do some sight seeing in and around Vancouver. One of my colleagues from another university mentioned that this may have been the most Facebooked Academy of Management Conference in history, because the city is so beautiful. Vancouver is definitely a beautiful city. Within the city, I liked the Waterfront and Stanley Park, two areas that helped me stay connected to nature. The rest of the downtown area didn't excite me much, because it was just like any other major city, filled with high-rise buildings. But then I'm biased towards nature. 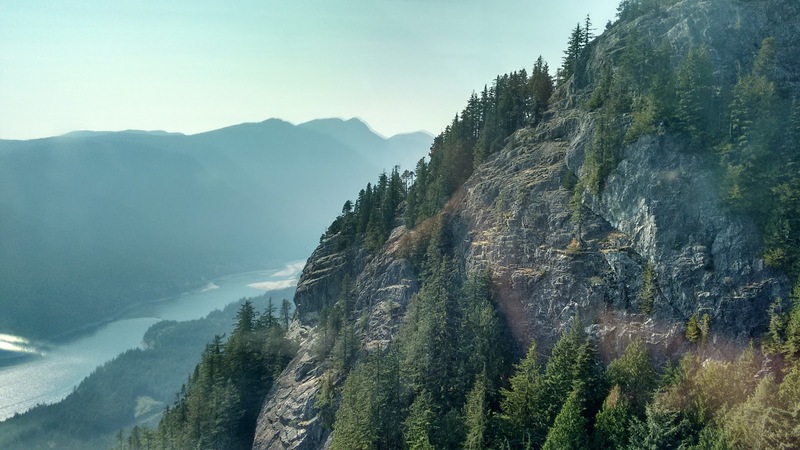 Thankfully, the outskirts of North Vancouver is packed with beautiful mountains and excellent hiking trails. I got the opportunity to hike parts of these trails on my first and last day in Vancouver. Most of the pictures below are from those two hikes. The highest point of my Vancouver trip was both literally and figuratively the Grouse Mountain. The trail up the Grouse Mountain is called the Grouse Grind, which is only 2.9 kilometers in length. However, the trail is very steep with an elevation gain of 853 meters (2800 feet). And because it is so steep, they only allow hikers to climb up the trail. You are required to take the cable car on your way down. Thinking 2.9 kilometers to be too short a distance for an endurance runner like me, I went up the trail without carrying any water with me. That was foolish of me, not just because it was a hot summer afternoon, but because I had been out of touch with climbing mountains. Also, with my overconfidence, I started my hike by running up the trail. By the time I covered the first quarter of the trail, I was completely exhausted. So I had to take several one-minute breaks to catch my breath. With a lot of difficulty I reached the halfway mark in 33 minutes and 30 seconds. It is that point that I determined that I have to complete this climb in under 1 hour, howsoever difficult it may be. So I pushed myself hard. I finally made it to the summit with only 7 seconds to spare at 59 minutes 53 seconds. If I had planned things well, I could have certainly done better, but it felt good that I achieved my goal. My time was by no means extraordinary--the trail record, I understand is below 30 minutes--but as I always say, endurance activities are not about beating someone else's record but about competing with my one's own self. The mountains that you see in the background are in North Vancouver. 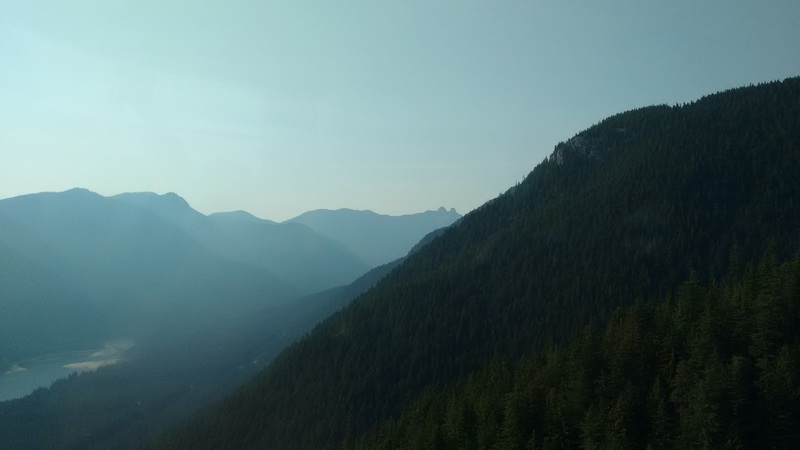 You can take a regular bus to go from Vancouver to North Vancouver. However, I strongly recommend taking the ferry (called Seabus) to cross the sea between Vancouver and North Vancouver. It's fast, unique, and much more beautiful than traveling on a regular bus. The nice thing is that the day-passes in Vancouver allows you to travel on all forms of public transport--train, bus and even the ferry. One of the major tourist attractions in Vancouver is the Capillano Suspension Bridge in North Vancouver. The entrance to the Capillano park is pretty expensive at $37.50. I didn't go inside the Capillano park, but I passed by it on my way to the Grouse Mountain. I found the place to be very crowded, probably because it is heavily advertised in the tourist guides. So if you are like me who prefers less crowded places, a cheaper alternative to the Capillano Suspension Bridge is the suspension bridge in the Lynn Canyon Park. Here the entrance is absolutely free and the place is much less crowded. The nice thing about this suspension bridge is that it is narrower than the Capillano Suspension Bridge (although shorter), and thus shakes more while walking, making it more exciting. Sat in meditation here for about 15 minutes. It's so much easier to meditate when everything around you is so tranquil. To some it may be boring to sit through full days of conference presentations, but to me learning about the latest developments in my field is one of the most exciting things in life. Not surprisingly, I ended up attending sessions from 8 in the morning to 6 or 8 in the evening. One unique thing about Stanley Park is that unlike most city-based parks, it has a lot of hiking trails that go through wooded areas. These hiking trails are easy, but like me if you prefer quietness and spending time in woods, you should explore to the Western section of the Stanley Park and not restrict yourself to the popular Eastern section of the park. The picture above is from the Eastern section of Stanley Park. Sunset from my hotel window in Vancouver. The picture doesn't do justice to how beautiful the sunset was. I'm not particularly fond of fancy hotels, but the nice thing about staying on the top floors of a high-rise hotel was that I got to experience this ethereally beautiful sunset one evening. 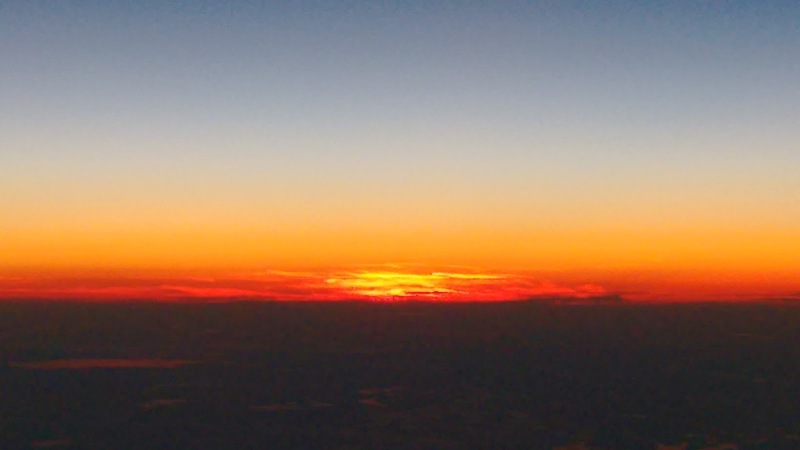 On my flight from Vancouver to Toronto, I experienced the most beautiful sunrise I have ever experienced from a flight. The above picture that I took on my cellphone doesn't do justice to how beautiful the sunrise actually was. With most of the passengers asleep on the flight, this was another nice and quiet moment to connect with the beauty of mother nature.